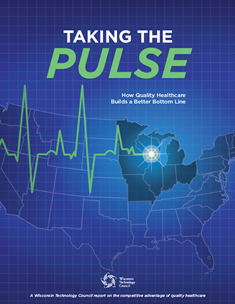 Wisconsin’s consistently strong rankings for quality health care are a tangible marketing asset in the state-to-state competition to attract and retain companies and workers. Creative employer and health-care partnerships are saving money and improving outcomes for workers, often by emphasizing preventive care and addressing health problems before they become more serious. Wisconsin is consistently one of the top states for quality health care, as measured by 200 metrics compiled by the federal Agency for Healthcare Research and Quality. It ranked No. 1 in the nation in 2017. In the seven-state region surrounding or within a day’s drive of Wisconsin, only two other states (Iowa and Minnesota) ranked in the top quartile. Wisconsin has ranked no lower than 7th nationally since 2006. Wisconsin ranked just $3 above the national median ($4,666 versus $4,663) in the average employer share of single premium health insurance in 2015. That placed the state in the second-lowest cost quartile among the 50 states. Wisconsin was $800 above the national median ($13,187 versus $12,387) in the average employer share of family premium health insurance for the same year, still outside the most expensive quartile. Wisconsin health insurance premiums are growing slower than other states in the seven-state region and the nation, especially since 2010. For single coverage, the cost increase has averaged 2.2 percent per year versus 3.8 percent nationally. Wisconsin ranked second best in the nation in this category. For family coverage, the cost increase has averaged 4 percent versus 4.5 percent nationally. Wisconsin is tied for 10th nationally in controlling the growth in family coverage premiums since 2010. Wisconsin also ranks favorably in national and regional comparisons of mortality amenable to health care, Medicare 30-day hospital re-admissions, hospital length of stay, mean inpatient charges, the percentage of the total population covered by health insurance and use of electronic health records. All are rankings that speak to quality while controlling costs. The report notes that Wisconsin’s Worker Compensation costs rank above the U.S. average. The average cost of WC insurance per $100 of payroll in Wisconsin was $1.77 in 2012, according to the National Academy of Social Insurance. The state ranked 12th highest among the 50 states in that four-year study. A separate ranking by the Insurance Journal noted Wisconsin’s WC premium rate had dropped to 23rd among the 50 states by 2014. Policymakers and economic development professionals should routinely tout Wisconsin’s status as a high-quality, affordable state for health care. Quality health care is a tangible part of the state’s brand and should be promoted as such. This should be a collaborative effort between public and private entities. Employer and health-care organizations such as the Wisconsin Hospital Association, Wisconsin Manufacturers & Commerce, the Wisconsin Technology Council and others should encourage more business-health care partnerships such as seven “case studies” highlighted in the report. Wisconsin is a state with major research and development assets in health care, as well as some of the nation’s leading health-care delivery companies. That technological edge, not present in many states, contributes to the overall quality of care. It is also a source of innovation that should be supported by health-care systems in Wisconsin through clinical trials and other pilot programs. Health insurance in the United States is largely regulated by the states. The Office of the Commissioner of Insurance should be encouraged to report on ways to improve Wisconsin’s health insurance coverage rate as the Obamacare debate moves to a new stage. That report could examine what effect, if any, the state’s diffused health insurance “market share” has on that coverage rate. It could develop a strategy to use federal waivers and other mechanisms to enhance and leverage existing state and federal dollars to reduce the number of uninsured. Wisconsin faces a growing shortage of workers. That makes every healthy day on the job for existing workers more important. State health-care policies should preserve and strengthen high-quality care to keep existing workers healthy and to attract new workers and companies. Areas of emphasis should include building a stronger health-care workforce; using technology, science and regulatory changes to improve health-care efficiency; and using health-care data and analytics to improve population health and to control costs. The report is available online at www.wisconsintechnologycouncil.com. Printed copies will be available soon.